The Williamsburg slim Japanese selvedge tall jeans for men are American made from a rare deadstock Japanese denim and produced by Kuroki mills of Japan. There is a slight vintage tint in the white yarns, which also have an uneven twill pattern. Our Grand Street fit has a medium rise with a modest amount of ease at the thigh, and slight taper to the hem. 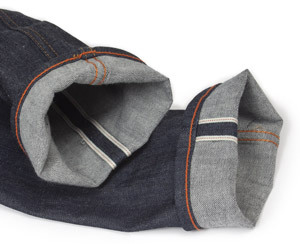 In the big and tall denim collection, long inseam jeans range from 38 to 40-inch inseams. For guys in need of a 36-inseam, we suggest our hemming alteration.